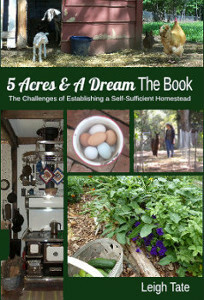 5 Acres & A Dream: So Where Do They Hang Kitchen Towels These Days? They are beautiful towels. I don't blame you for wanting to hang them up. We hang ours on the fridge handle and the oven door handle. We only bake on weekends, so the oven door is rarely opened. I guess people clean up their kitchen clutter for pictures. (Raising my hand...) That's EXACTLY what they do, Leigh, use the dishwasher and dry their hands with paper towels. Until a few years ago I rarely used my dish towels, I used paper towels. When we started thinking more frugally we brought out the little used hand towels and use them all the time now. Mine hang on the door under the sink. Yes this is so true! But irrespective, I shock all visitors, ha ha and hang them publically on the oven door. Come on people, be proud of the work you do and show off that you hand wash dishes. Enough of this denying life. I have green and white stripped kitchen and living room curtains and have matching tea towels. Didn't cost the earth and look good to me! I hang my towels on the oven handle, although not all stoves have the kind of handle you can do this with - my last stove didn't and having a handle you could hang towels on was a must with the new one. My friends cannot believe I don't use paper towels, but I haven't for about 20 years now. Sure don't miss that expense. several years ago I was at an antique store and found a towel rack, the one with the four arms that swing, there is just enough room between the window molding and the cabinet to mount it. It hangs right over the left edge of my kitchen sink. Very handy, much closer that refrigerator door handle, oven handle doesn't have that capablility and is farther away. Paper towels are definitely NOT the norm on this side of the pond. Indeed, I'm quite shocked to learn of such behaviour! Paper towels are useful for many things, but I wouldn't dream of using them for routine drying. We have a dishwasher, but its handle is perfect for the tea towels we use on non-dishwashable things (we like handmade ceramics as well as handmade textiles). The towel specifically for hands, as opposed to dishes, lives on the back of the kitchen door. I hang mine on the oven door too. It worked well with the gas stove as the heat would dry the towel. It is a little more tricky with the wood cook stove. Good chance the towel will go up in smoke. I never thought of a towel rack. I also hang mine on the oven door. After reading the other comments, I now know what that wiry-army thingy mounted under the sink was! It's just awful what people do with paper towels these days, isn't it? LOVE your summer & winter towels! 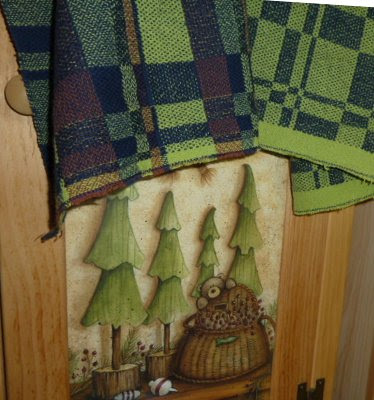 I hang the "drying hands" towels on a fits-over-the-drawer rack next to the sink, and the "drying dishes" towels hang on the oven handle (also close to the sink). We do use paper towels, because we have cats, who make messes I'd rather not have to wash out of cloth (ick). But we don't use them in the kitchen anymore, and that's a money-saver and makes us feel better about the waste-stream. It's funny you bring that up. I used to complain there was no place for my towels either. Now I hang them on the doors that are under the sink, since that's where you generally use them. I purchased a magnetic towel bar and put it on the refrigerator. I hang mine on the oven door. I think I want to put a towel rack closer to the sink too. I always have a hand towel on the counter next to my sink; I can't stand dripping everywhere to retrieve one, and have no hanging surface near my sink, which is in an island. We hang ours on the oven door handle as well. I haven't bought paper towls or paper napkins in years. When we first switched to cloth napkins and had friends come over, I wouuld give them a cloth napkin. They would ask me if it was okay to use it, especially if we had a finger food type item. They were afraid to get them dirty. Now, I think they are used to it and don't ask anymore. We also use real forks and plates when we have parties and people think we're "fancy." Anyway, I digress. Once you get everything in place, I'm sure the perfect spot for your towel rack will surface. Nope, don't use paper towels here for things like that...would DREAM of it!! We actually hang our towel over our draw..we just open the draw a little, hang it and close the draw! with our humidity I'd be foolish to hang my towels inside something! I'd probably have them mouldy over night:)) we have a timber rack over the oven in the kitchen, that we can let down if needed (but the ceiling is so low that I can hang them up with just a little stretch). they dry quickly and are easily "whipped" off, when needed. I only use paper towels if I have to take broken eggs off the floor etc. :)) of course you can hang lots of other stuff on that rack as well - very useful for me (like herbs etc.) anyway, with gorgeous towels like yours you should display them!! Such fun reading all the comments. 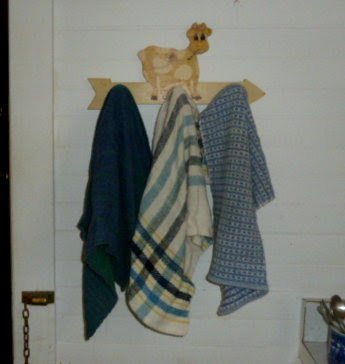 Where to hang a kitchen towel is something we take for granted, and now you know we'll all be looking at pictures to discover where "they" hang them. Oven door, fridge door, tucked inside a closed drawer . . . all good ideas. However those towels of yours are absolutely beautiful and should be displayed somehow. They're sure prettier than any of mine! And that cute little towel rack your mother-in-law made will be more and more meaningful as the years go by. Our kitchen counters are solid birch. We purchased a simple rail from IKEA. It is screwed onto the underside of the counter, and at 55 cm (20 in) is just long enough to hold a hand towel and drying-up cloth. The depth of the counter at that point is only 22 cm(8 1/2in), as it was where the old back door was before we extended the house in 2000. That is where our kettle and coffee machine stand. We are huge into using our kitchen towels...we use very few paper towels because we prefer to use the cloth variety. But, I also notice that so many people have shunned their kitchen towels! We also hang ours on the oven door handle. Beautiful weaving, Leigh! I am quite a fan of anything green - and the patterns are great. Learning to weave is on my bucket list. But I'm hoping to get a jump start this winter. Thanks for the link to the pattern. As far as kitchen towels, I hang mine on the handle of my oven. I've just knitted up a mitred towel with a hang tab that works wonderfully! Lovvely towels! And it's been fun to read all the comments. I hang mine over the oven handle- like so many others here ;) Also, I was at Bed Bath and Beyond not long after we remodeled our kitchen and picked up two lovely over the cabinet door towel racks that now grace the sink base doors. Otherwise I tend to drip on my way to the stove which makes the floor messy. Ya'll, it's been a busy day and this is the first chance I've had to respond to comments. Please excuse my not addressing most of you personally. Just know that I love your comments. I found it very interesting that so many of us use the oven door handle as a towel rack. I have too, especially when my little 3 peg cow rack is full. Unfortunately mine usually fall off onto the floor, or hit the floor when I open the oven door! Also interesting that so many kitchens make no provisions for dishtowels, which is why we're resorting to the oven door in the first place. I appreciate all the creative solutions, especially the over the door racks, the armed rack, and the magnet on fridge idea. I will certainly incorporate some of these ideas in my kitchen. I agree about using (or not using) paper towels, though Dan was one who grew up using them to dry hands, so I have to keep them handy. With the kitchen torn up now however, there's no place to put paper towels, so we may be developing some new habits! And yes to cloth napkins as well. I LOVED this idea from another blogger -- she installed towel rings from the bathroom on the cabinets on either side of her sink. It keeps the towels up off the counter, allows for air circulation to help them dry, and they're right at the sink ... where you need them. I haven't done it in my house yet, but it's on the To Do list. Maybe that'll work in your new kitchen too! Another "over the oven handle" towel placer here! And I agree, those are beautiful towels you made, they should be displayed! Your handmade towels are GORGEOUS! I'll never get around to weaving, I just know it. But I sure can admire yours! Funny you did this post because I was just walking around the kitchen contemplating this very same thing the other day. I've always used the refrigerator handle but would like to find something better. As for the kitchen/home decorating magazines and books, there are a LOT of practical things they seem to "forget" to include. My main complaint is the spreads on big, huge kitchens containing every appliance invented by man . 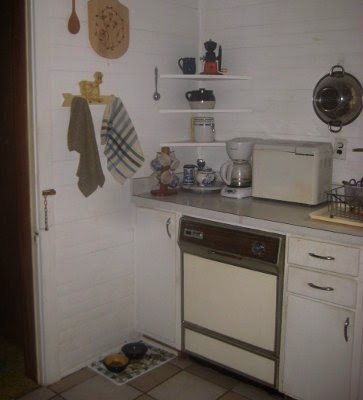 . . and only four kitchen cabinets! Lovely panoramic views of the out of doors through windows above the acres of counters, but where the heck do you store your dishes, pots and pans, cooking/baking supplies and, oh yeah, food??? 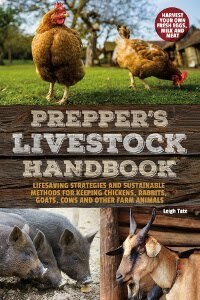 Do you know the hooks that are used to grab a bale of hay? I've painted one black and hung it up by the handle and it makes a jim dandy towel rack on the wall. Just an idea...enjoy your wonderful kitchen!! I thread mine through a drawer handle. It's near hand level, I can place it in multiple locations, and it stays in place. Our stove door handle is a good spot for towels as the stove is next to the counter beside the sink and the dish cupboards are on either side of the stove. There are some good towel racks that hang over cupboard doors, I have seen them in hardware stores but haven't used them myself. I can't imagine using paper towels tho, and for drying hands I have some of the button on towels that hang on the stove also and we change them out every few days. We don't have a dishwasher so use dish towels all the time. I have a lot that are old sugar/flour sacks from the 20's and 30's that seem to last and last and are large enough. The towels I see in stores now are usually too small. Val, I've seen those towel racks and will have to look in to them. I saw a really pretty one in a mail order catalog, but can't recall which one. I agree about store bought towels. Too small and if they have polyester in the fabric, forget it. Love the idea of the feed sacks. The dishwasher in that photo was nonfunctional when we bought the place, and it's taking a permanent hike when we get to that corner of the kitchen. my sink is under a window with cabinets on each side. i put towel hooks up on each side and throw my towels over them. i hate wasting paper towels. i think we have the same loom, Glimakra countermarch? mines 54" and i'm weaving kitchen towels right now. they make great christmas gifts. Chris, I've been thinking about doing the same thing. I have a cute handpainted sheep hook I may use for that, I'll just have to wait until the cabinets are all up.